Are you in the early stages of your #voiceover journey and thinking of having a demo made soon so you can get more bookings? Watch this video first before you do that! It might just save you from spending $$$ unnecessarily! Have you made your voiceover demo yet? If you haven’t, when should you get it made? Have you had it made, but aren't getting any work from it? If so, what could be wrong? Knowing the answers to these questions will help save you from wasting a lot of time and money unnecessarily, or if you’ve already spent the time and money -- at the very least, you'll know what to do moving forward so you’ll have more success of getting voiceover work in the future. So let's jump into discussing when to get your demo made! Needless to say, in the world of voiceover, a demo is extremely important. It's like your business card, especially if you’re brand new to this industry. It represents your ability, your talent level, and your style. It’s what you send to potential clients or agents when auditioning or when trying to get onto their rosters. And because it is THAT important, a lot of aspiring voice actors jump into making their voiceover demo ASAP. Now that seems to make sense, right? After all, to become a legit voice actor, you need to have bookings, you need to have projects, and you need to have clients to record for. And you can only start marketing yourself, applying to job posts, and auditioning for work if you have that demo, right? Here's the thing: If the first thing you do when you decide to get into the voiceover industry is to go out and record a demo, you're probably not going to book a lot of jobs with it and you're probably not going to get on any voiceover rosters. A demo is an art form. To do one correctly, it requires a lot of skill on your part -- a lot of practice, talent, and intuition to be able to interpret copy, read scripts, and take direction. It also takes the skill of an experienced producer or engineer to make sure you're getting the best quality out of your demo. Let's put this in terms of food. Let’s say that you want to be a chef, and there's a group of potential investors that you want to impress with your cooking so that they will invest in your restaurant and give you a chance. If you have no prior experience cooking, you're probably not going to go out and make your menu first thing, cook up a bunch of food, take it to the investors, and hope for the best. What you should do is learn about the industry, practice, get a mentor, learn how other people made it in the industry, and wait until you know that you’re competitive to make your full menu and put your finished product in front of people who are gatekeepers in the industry. To put it simply and clearly: You don't need a demo first thing. As a matter of fact, that's the last thing that you should do. The reason I was prompted to discuss this today is because I've had several experiences in the past several weeks where someone has reached out to me and said “Hey, so I want to get started in voiceover. I know I need a demo first, so...” And I have to say “Woah, hold on. Pump the brakes a little bit. Getting your demo made right now is actually one of the worst things that you could do." But what's worse is when someone reaches out who has already spent money on a demo as their first move getting into VO -- before getting any training. These are the saddest conversations I have to have and the very epitome of putting the cart before the horse. I'm sure you've probably picked up on at least a couple of reasons why you shouldn’t do a voiceover demo first thing through the course of this post. But let’s expound on this some more. For one, if the first thing you do is make a demo, you are going to outgrow and outperform your demo almost immediately, as soon as you start getting training. Your performance level will immediately improve, and as you continue training, even as a full time professional (I personally am still continuously getting training), you will get better and better and better. So when you make your demo, it's going to represent your ability at the time of that recording. And so as soon as you start getting training, you will immediately have outgrown the demo. Picture this: You’re starting in the voiceover industry, and you go and get your demo made. You spend, $1,500 on it -- that's about an average amount. You think it sounds great, and maybe your mom and your husband think it sounds great, too (but neither of them are in the voiceover industry). Then, you start getting training, and you get a coach, and you start getting better and better. A month goes by and you listen back to your demo that you had made a month ago, and you cringe and go, “Oh my gosh, I am way better than that. I can't believe I sounded like that.” And even worse, “I can't believe I spent money on that!” because now, it doesn't represent you. Now, another thing that can happen is maybe you pay a bunch of money to get your demo, and the people who are making it for you coach you through that demo, telling you exactly how to perform the copy as you’re recording your demo. Then, when you get the finished demo and listen to it, you think it sounds pretty darn good. But the danger there is that -- since you were so heavily coached getting your demo done -- that performance is not something that you can replicate on your own without someone guiding you and directing you through the scripts. So if you were to get a job based on that demo, the client who hired you would be disappointed with the final product that you deliver because you wouldn't be able to replicate what you did on the demo. Since most of us do almost all of our work from home on our own, it means we have to be able to direct ourselves. So as you're performing the copy, you're also directing yourself most of the time. As a new voice actor, you're probably not good at directing yourself yet. So having a coach, or a demo producer, or someone who will coach you through the demo is going to give your demo a false sense of ability... when in reality, you don't have the chops yet to make those decisions or that type of read on your own yet. You will immediately outgrow and outperform it as soon as you start training, and it will not represent your performance level once you start training. If you get heavily coached by the people who make your demo, you most likely won't be able to replicate the same performance quality when you self-direct in the future -- which means that clients will be disappointed with what you'll submit to them because it won't be on par with your demo. So then, when do you make your voiceover demo? If you don't make your demo immediately when you get started in voiceover, what do you do? And when do you make the demo? Well, this is both good news and bad news. Let’s talk about the “bad news” first, and it's only bad if you aren't really into voiceover for the long haul anyway. The “bad news” is that, it's going to take a little while before you're at that point where you’re ready to make your demo, depending on your background. If you are an actor and you've taken acting classes before or if you have other skills and experiences that are going to give you a head start in the voiceover field, then you're not going to have to wait as long. But if you are brand new, you're fresh, you're coming from another career, or maybe this is your first career and you're just getting started in voiceover -- it's going to take a little while before you are ready to make that demo. But if you noticed, I placed quotation marks in “bad news” because its being “bad” is relative. And here’s where the good news comes in. Despite the fact that you need to wait until you’re ready to make your voiceover demo, this time that you're waiting to do the demo is still fun! If you're in voiceover for the long haul, if you love the work, and if you enjoy the process -- then it's not like you're just waiting around until you’re ready for the demo. You’re training. You're learning about the industry. You’re diving deep and gaining knowledge about the industry. All of that is really exciting and fun. You can even be auditioning while you're waiting to be ready to make your demo. So it's not necessarily a bad thing that you're waiting to get your demo done because it's a very active waiting. So when should you make a demo? The simplest answer is: It depends on your individual background. 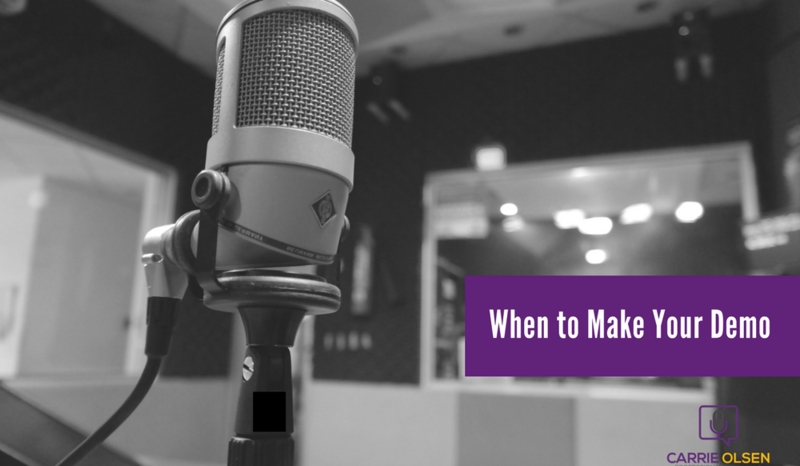 No one can just make a blanket statement and say, “It's going to take everyone a year from when they start getting training until it's time to make a demo.” It's just going to vary drastically depending on where you're starting in your voiceover journey. This is not new info for me because I’ve been in the industry for a while. I already have a demo, so this isn’t applicable to me anymore. Great! I've got something coming up for you in the coming weeks that is going to be really exciting for you. If you're in that spot where you’re already getting work or you're ready to get work, I’ll be sharing valuable information on how you can go about getting those clients. It doesn't have to do with pay-to-play sites, which means you won't need to be auditioning on subscription sites. It's a way that will help you to build your brand, get you more control over your business, and increase your bookings drastically. If this sounds more up to your speed, click “Keep me in the loop about the booking program” -- and I'll make sure that you'll get first dibs on this! If you're new to the industry, and you're still at the point where you have so many questions you need answers to, then you are going to benefit from getting a lot of good information and just giving it time to sink in. 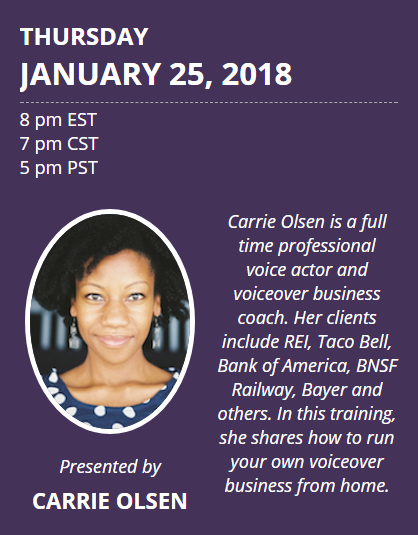 If you’re in that spot, then I invite you to attend a free one-hour webinar on getting started in voiceover called “The Voiceover Startup.” It's perfect for people who are curious about the voiceover industry and want to know how they can get a ton of the best information so that they can get going on the right foot. If you would like to attend that free webinar, just click the button below to register. If you prefer to text, just send “VOStartup” to 44222, and I will send you information on how you can get registered for that webinar and get a ton of great free information about how to get going. Thanks for taking the time to read today’s post, and feel free to drop a comment below! ​Want to get more voiceover work? Lost on how to turn your voiceover career into a thriving business? Looking for ways on how to stand out from other voiceover actors? Fill out the form below to get more deets on the Booking Program.